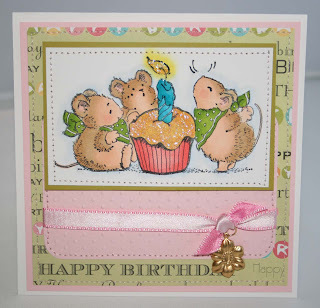 Here is another adorable stamp from Elzybells that I used to make this birthday card. The bears are colored with pencils and oms... I think they are so cute. Hope everyone has a great weekend. I had to make my daughter a Wedding card for a wedding she had this weekend. 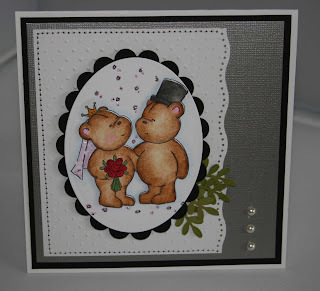 So I chose these adorable wedding bears by Elzybells. I just think they are sooo adorable. Very easy and simple. The bears are colored with Prisma's and OSM. 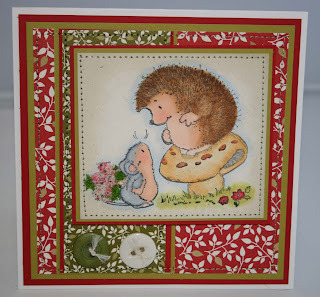 Here is another Elzybells stamp which I think is so adorable. He is colored with pencils and OMS. I couldn't really find any background paper to match this is all i could come up with. Hope everyone has a great weekend. Here is the first card I made for Soft Pencil. Isn't she too dang cute. It is digital stamp which is nice because you pick the size. 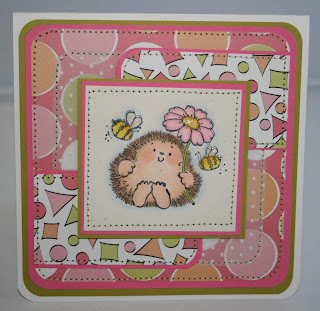 I normally make my cards close to 6 x 6 so I like mine bigger. Also all my cards if possible are 3d so it makes it easier to cut out portions. This is colored with copics which is my favorite choice of medium's. 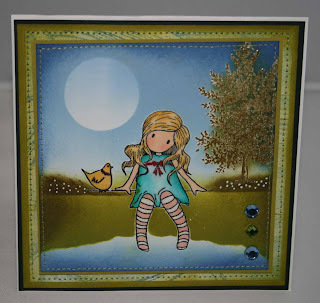 I also too Spring Rain from papertrey inks and went around the edges. Paper I had in my pile of scraps. 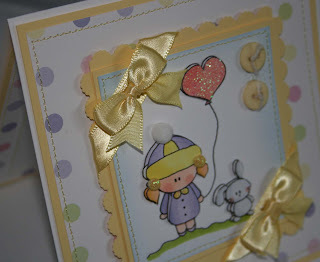 The Buttons and ribbon and cardstock are also papertrey ink. Hope everyone has a great weekend. Looks like rain here. Here is a Father's Day Card I made for my Father In law... 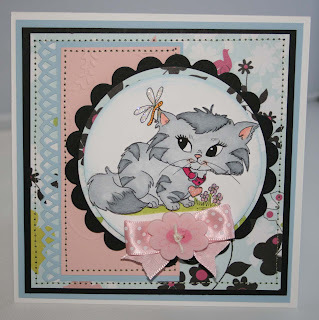 I just love Elybells stamps they are way too cute. These bears are my favorite. This one is colored in Pencils and Prisma and then I sprayed the grass with copics and the water and sky are brayer. I was digging through my stamps last week and found this Stampin Up set I never used LOL. So thought I better take it out and use it. No coloring on this one all inks and brayer. I did make some cute cards tonight I will take pictures tomorrow of them to show you. I have been listening to Book 2 of Diane Gabaldon - The Outlander Series, which I probably have an hour left. If you haven't read them they are good. It is about a lady who is from 1940's who gets tossed back in time to the 1700's. Anyways until tomorrow... Have a great evening. Here is another card I made using Michelle Zindorf's brayer technique. I just love these little girls. I know set 3 is due out the end of the month. I can't wait. I was also asked to be part of the Softpencil Design Team which I happily accepted. Spiral Whisper closed their doors so I have a bit of free time because of that. 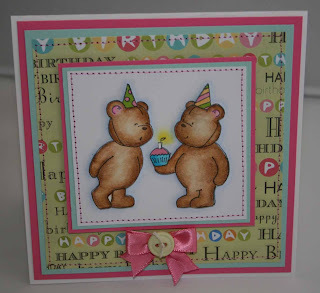 I will still be making cards for Victoria Case also. Stay tuned this week for my first card from Softpencil. Have a great weekend. Last week I told you I took Michelle Zindorfs brayer classes. So I thought I would incorporate her style with my style. She said she wasn't into cutsie which I so am. So I used my Gorjuss Girls and I made a scene with her. I showed my mom yesterday and she was already trying to figure out which holiday was next so I could make her one haha. 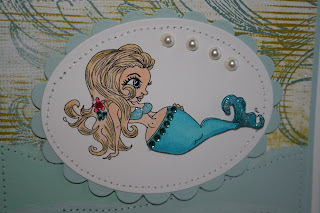 Anyways I hope you like her... You can view Michelle's blog here he has some great cards with tutorials also.... 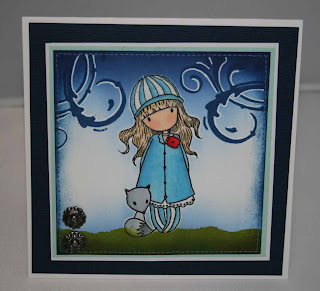 The Gorjuss girl is by Sugar Nellies which can be bought at Funky Kits. Isn't this too cute. It's a new digital image released on June 12th from Victoria Case. I colored her with Markers and made her bottom 3d. Added rhinestones and pearls. I thought this card turned out adorable. Here is a sneak peek at one of the digital images that Victoria Case will have on her website on Friday. Isn't it too dang cute and you can own her soon. She is colored with copics. Paper was in my stash. Hope everyone is having a fabulous week. 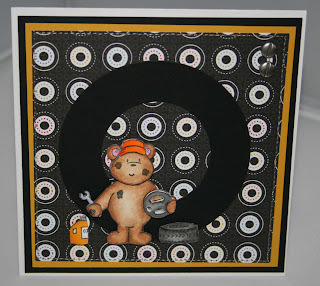 Another great Penny Black stamp which is great for Father's day or even a guy's birthday card. This card is colored with Prisma Pencils and Gamsol. 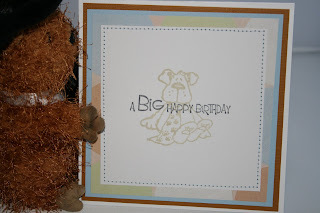 I used the new vintage ink from Paper trey along the edges. I also inked up the stamp with the same vintage ink since its so light and did one of this little guy on the inside and put the sentiment over it. Hope everyone is having a great week. 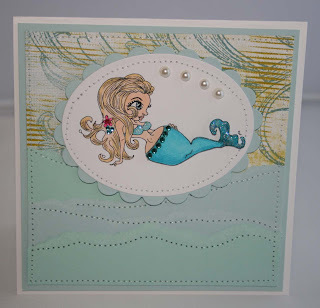 Tonight is actually my Friday since I took tomorrow night off so hopefully I can get lots of cards made. Here is another one of my favorite stamps. Who doesn't love these guys. I don't know if I like the idea that they are doing the acrylics. I have quite a few of the sets and they are way smaller than normal which I personally like the bigger ones. Anyways on to the point I was trying to make. This is colored in copics and edges sewn and parts 3d. Hope everyone had a great weekend. Today is my Tuesday when I go to work tonight also hump day for me because I am half way through my week. 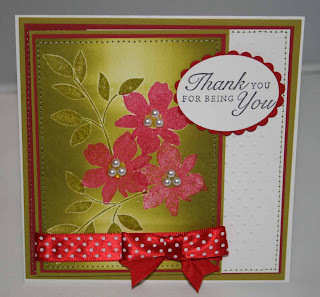 I am off my last midnight so hoping to get some cards made. 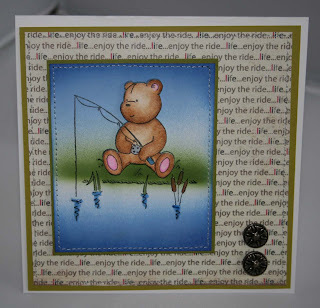 Oh don't know if anyone one knows but Hambo stamps has a bunch of retired cute sayings for dirt cheap. Last night at work I went through them and ordered like $40 worth which was orginally 4x that. Today I went to a couple Brayer classes that Michelle Zindorf was having. Did I have a blast and I learned how to use a Brayer... I will take a picture of one of the cards I made one day this week. They are absolutely fabulous. 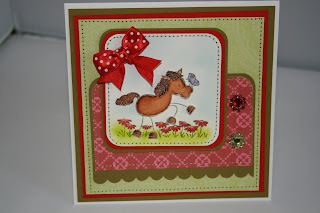 Here is a card however that I made this weekend using another one of those adorable Penny Black stamps. 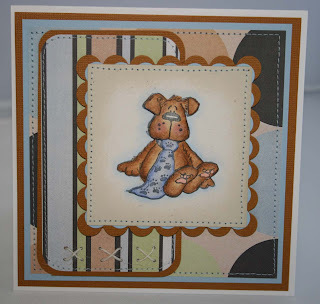 This one is colored in Copics on Rustic White cardstock from Papertrey Ink. Background paper is some that I had laying around. I sewed vellum on the background also that I ran through my cuttlebug cause I thought it was kinda too bright. I love those colors together though very tropical... Hope everyone has a great weekend. Well I didn't get nothing done on my days off of course LOL. I did lay out in the sun today though and listenined to my book while trying to get rid of a headache. 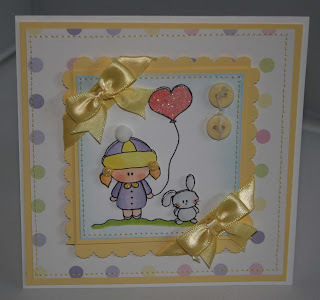 I made a couple cards also yesterday this being one of them. 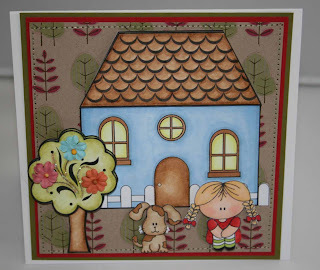 A couple I will show you next week which are new digital downloads from Victoria Case available on the 12th of June. This card was done in pencils and gamsol. Nothing special about it just an adorable stamp. Background paper is Papertrey Ink. Tomorrow I have to go to Michelle Zindorf's Brayer classes I have been looking forward to them a long time now. I believe I signed up in February. It will definately be a long day cause I will be there all day as I signed up for the beginner and advanced then it will only be like 2 hours before I have to go to work so instead of driving home which is over an hour I will just drive to work and maybe grab a bite and read or something until work starts. 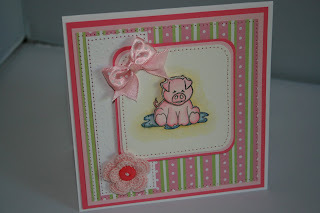 This little pig is from CD stamps. I just love him he's so cute. I watercolored this. The flower I got from someone on Etsy. She does such a good job.